This 2-week immersion experience in Cuernavaca, Mexico will explore communities of liberation in contemporary Mexico, focusing on LGBTQ and women’s communities and on issues of economic justice within Mexico and between Mexico and the United States. This CLGS program is in partnership with CILAC FREIRE language school. 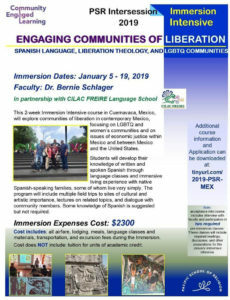 Participants will develop their knowledge of written and spoken Spanish through language classes and immersive living experiences with LGBTQ-affirming, native Spanish-speaking families, some of whom live very simply. The program will include multiple field trips to site of cultural and artistic importance, lectures on related topics, and dialogue with community members. Some knowledge of Spanish is suggested but not required. Immersion cost: $2300, includes all airfare, lodging, meals, language classes and materials, transportation, and excursion fees during the immersion. Cost does not include tuition for academic credit. For application form and additional information visit tinyurl.com/2019-PSR-MEX.